Build Your Own Coat Hanger Robot | OhGizmo! If you’re into robotics but don’t like your creations to have that corporate-polished look then this simple robot walker tutorial on Streettech.com will probably fit the bill nicely. 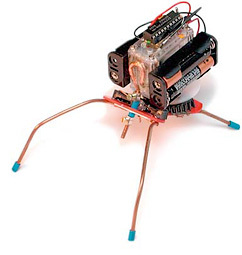 Keep in mind though as simple as this robot looks this project is not really aimed at the beginner from what I can tell. If you don’t know what a breadboard is or are surprised to hear they involve wiring you might want to just move along. Ohgizmo reported that you can now build your own robot out of items that you might have around your house. Ok, some you might not like a servo and resisters, but in general this can be built in the home with parts easy to find.